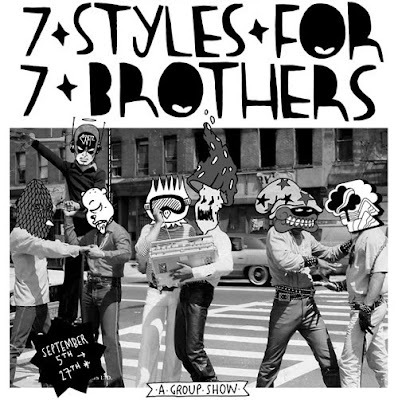 This Friday sees the opening of "7 Styles for 7 Brothers", a group show in Sheffield, curated by Kid Acne. We are loving the flyer image pictured above and also the fantastic line up of artist which includes Cept, Dscreet, Pinky, Kid Acne, Sweet Toof, Infinite Livez and Russell Maurice. The exhibition will feature new works and exclusive print from all the artist involved. The show is taking place at The Archipelago Works, and opens on the 4 September with a private view from 6pm. The show is invite only and you need to RSVP.